Click here to find out more about our medical product case studies. The slim design of the pump enclosure features built-in bottle holders to provide somewhere safe to keep the bottles and to prevent spills. The purple color is a key element of the Lansinoh brand and is used throughout their entire product range. The bottle sets are effortless to assemble, the sealing diaphragm (which prevents milk backup in the tubing and pump) may be inserted either way up and the components very are easy to clean and sterilize. The bottle set parts are mainly made from a high clarity polypropylene which has good impact and high temperature resistance. These parts routinely boiled, microwave steam sterilized or cycled in a dishwasher by users. 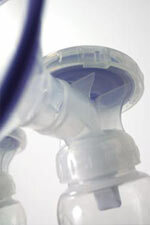 The materials used were thoroughly tested for milk & skin contact and all parts of the pump are BPA free. To improve comfort and sealing against the breast, Brightworks developed the unique ComfortFit™ breast cushions; 2-shot molded soft edge around the breast flanges. The designers were careful to select a material that not only provided the comfort & seal but could also be compounded and recycled as Polypropylene.